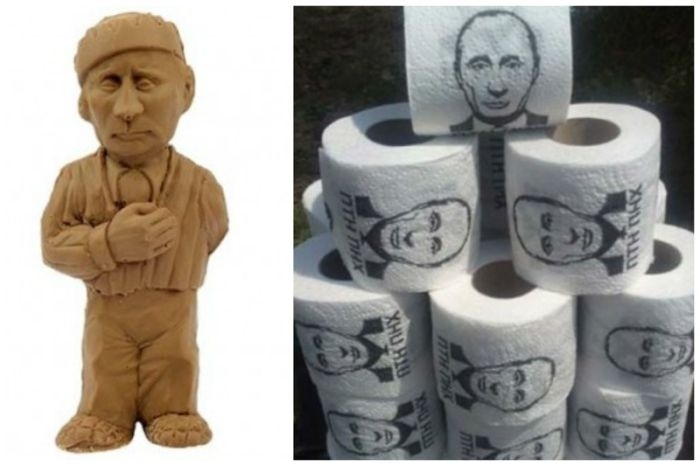 Examples of souvenirs with Vladimir Putin you can get in Russia. 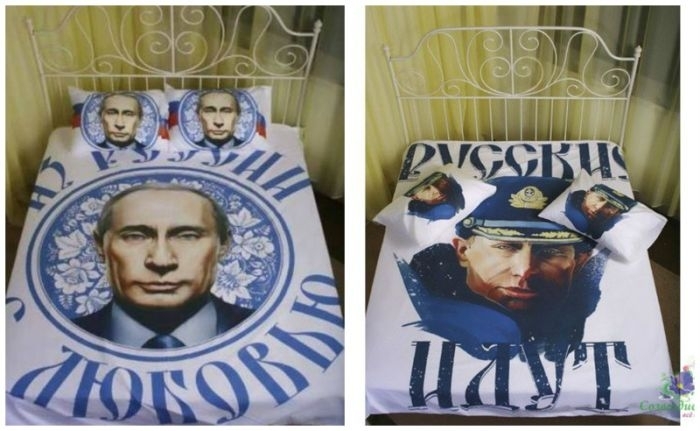 Starting with this “From Russia With Love” bed sheet and cover set. 2. 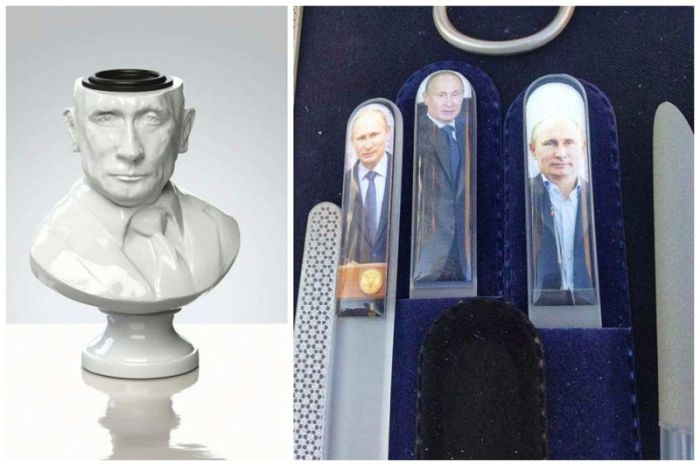 Inkwell in Vladimir’s head and and a paper knife with presidents portrait. 3. 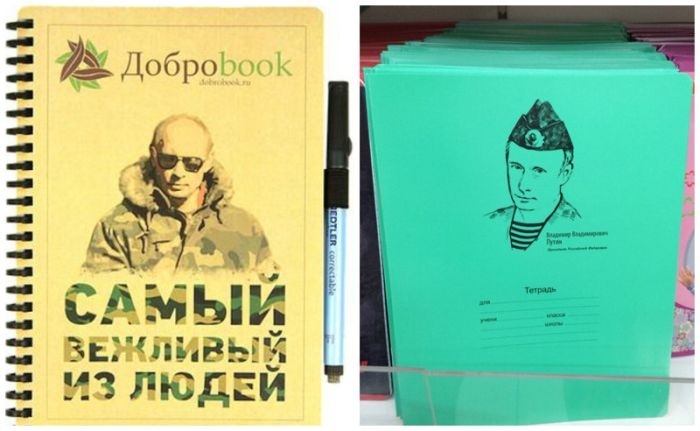 Assorted school notebooks having different photos of Vladimir. 4. 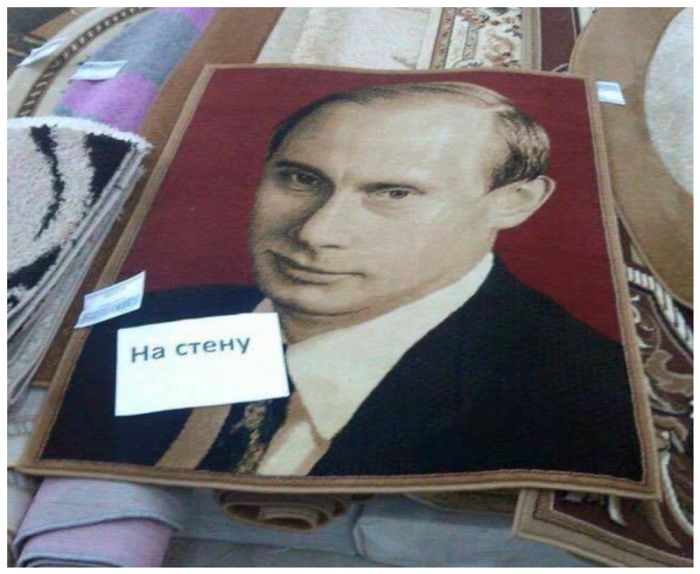 Wall rugs, Russian people adore wall rugs, with face of their president. 5. Skull rings, but instead a skull you get Vlad’s head, might be even more scarier to some. 6. Vladimir Santa and Vladimir Superman small figurines. 7. 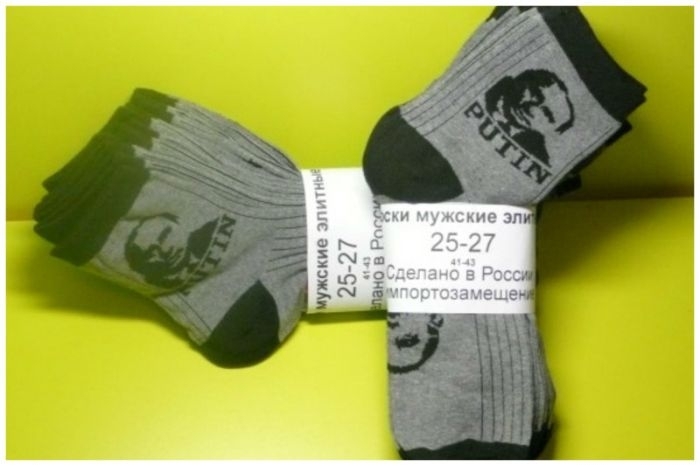 To get you faster in patriotic mood you can get Vladimir Putin men socks in black and grey color. 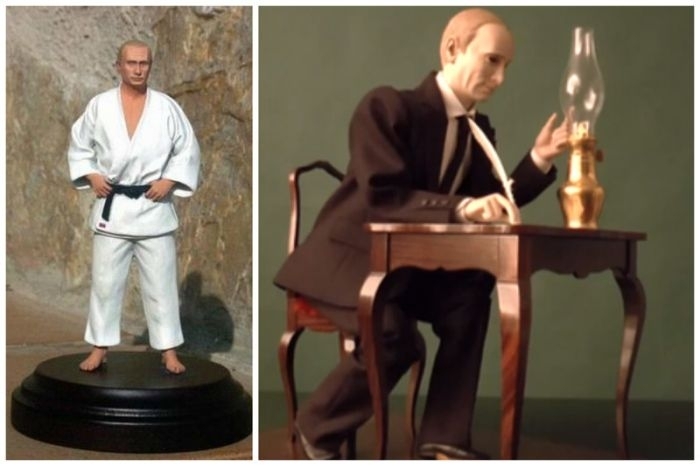 8 and 9: Vladimir’s bust tea pot and Vladimir Putin’s bust salt and pepper shakers. 10. 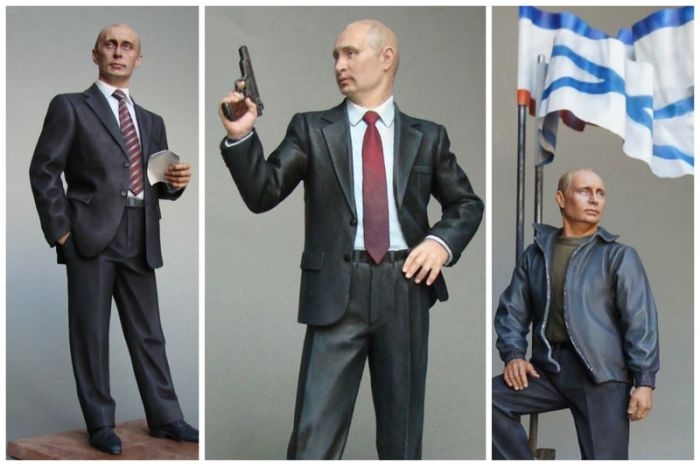 Just Vladimir Putin action figures. …and at his working desk. 11. 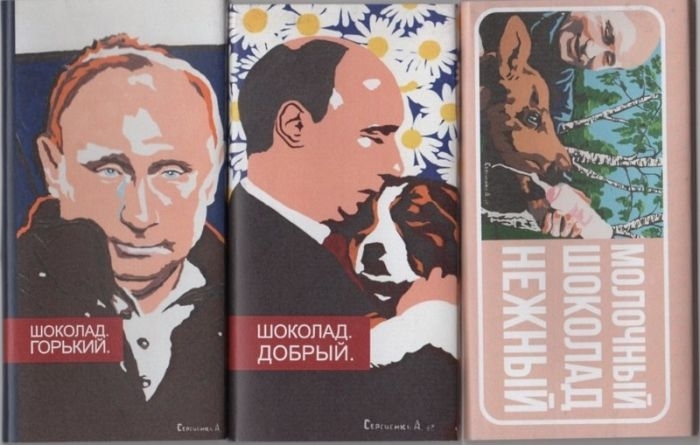 Vladimir Putin chocolate bars. Including Dark Bitter, Good and Milk Tender flavors. 13. 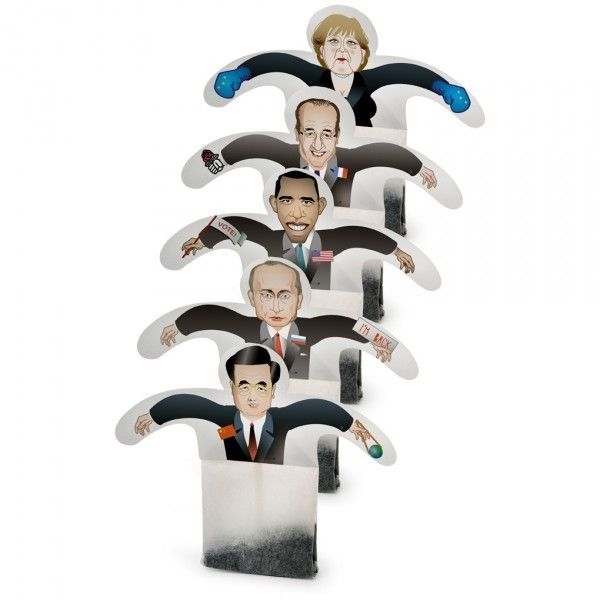 Vladimir and other world leaders tea bags. 14. 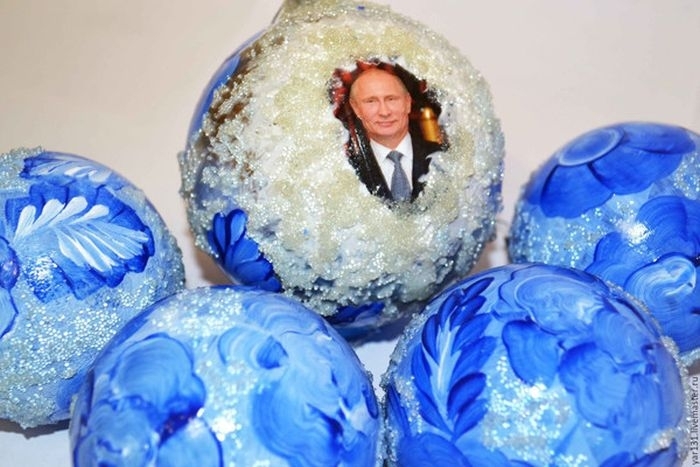 Vladimir Putin Christmas tree ornaments. 15. 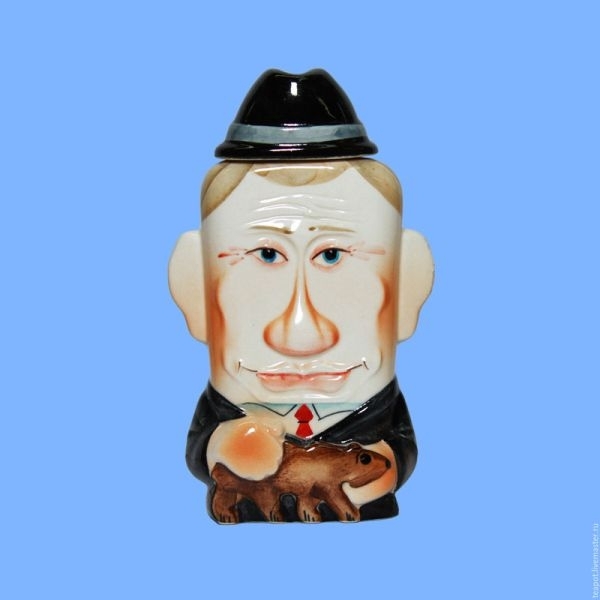 Vladimir Putin matryoshka (Russian nesting doll) and 16. 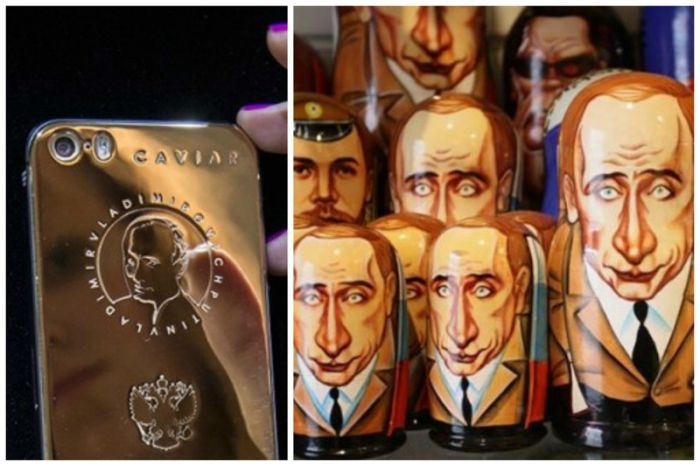 Vladimir Putin 24k gold iPhone case by Caviar brand. 16. 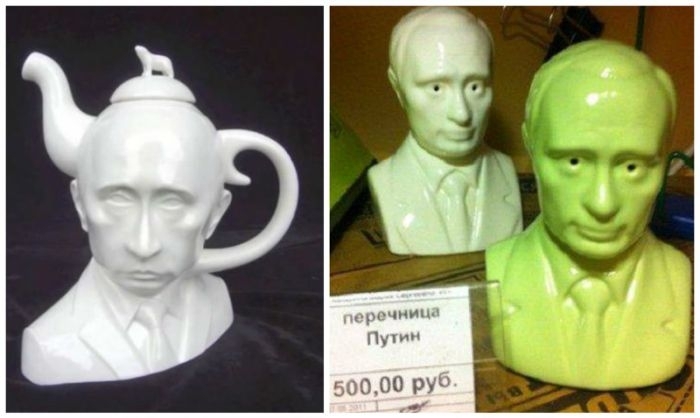 Vladimir Putin coffee mug. 17. 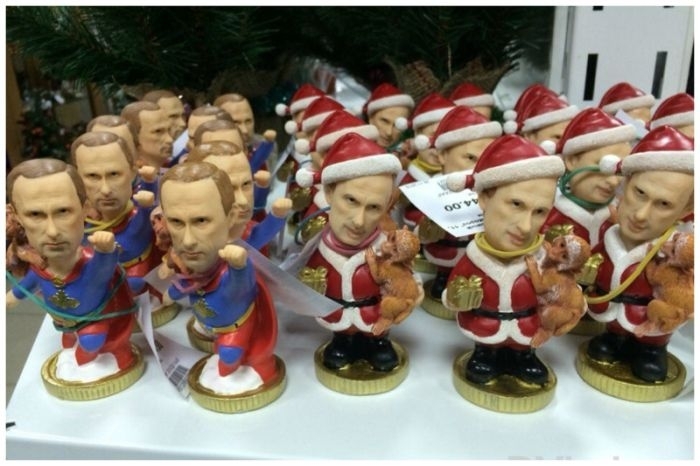 And you can get Putin’s merchandise not only in Russia. 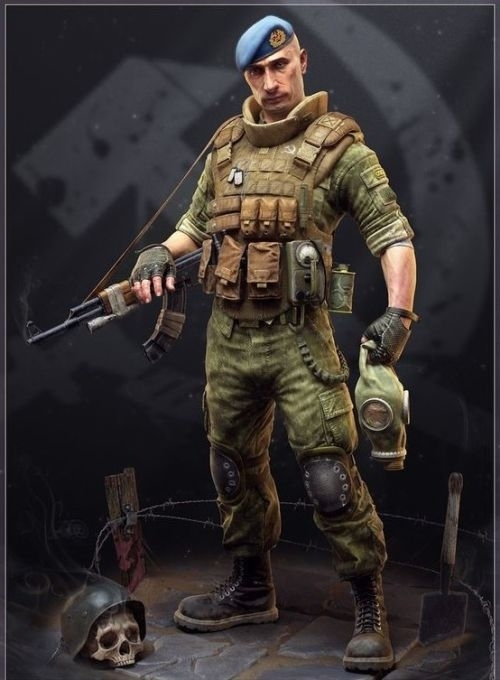 For example this is what you can get in Ukraine. Probably would be offensive for most Russians though. My mistake : it was on the last page ! Yeah, Ukro-Nazis have a funny way to express their helpless impotence. Fun to watch. 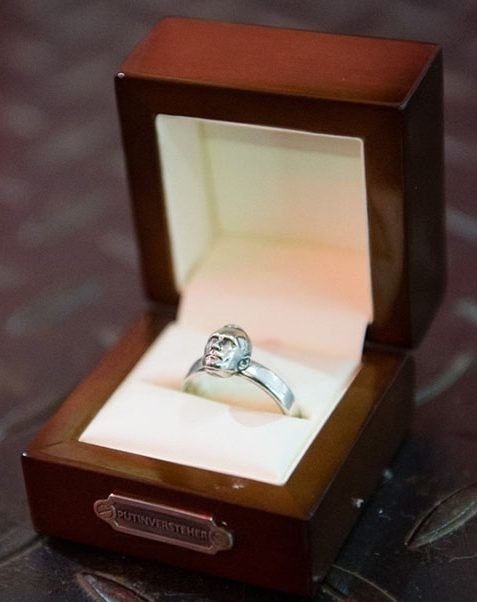 The Putin head silver ring……classic. 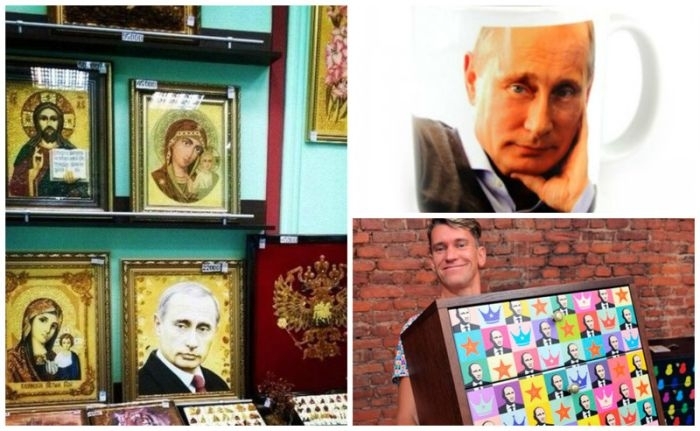 I am an Norwegian, and I admire Putin a lot. I really wish we had a president like him. Rob, have a bit of patience, you might have him as a president in few years, like it or not.